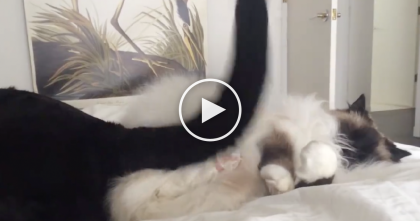 She Plays A New Game With Her Cat And It’s totally Hilarious!! 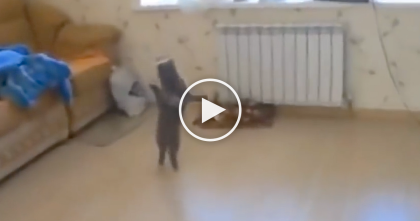 Just WATCH What The Cat Does, LOL. Some items she found a little more curious and entertaining than others and would bat them around for a few seconds. BUT in the end, all suffered the same fate! I guess she just really likes a clean table! 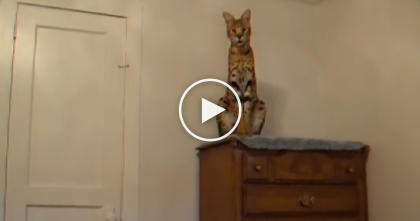 Don’t Underestimate This Serval Cat Until You See How High He Can Jump. WOW, This Is Amazing! He’s Sleeping, But Wakes Up To An ‘Annoying’ Surprise…What He Does? Awwww, It’s Kitty Love!! Kitty Smells Something, But Then Gets Scared… Now Watch How He Reacts At 0:07, Omg!! 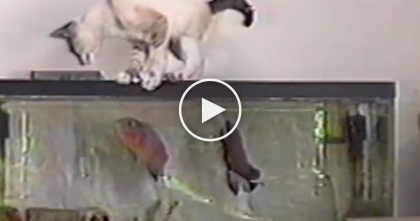 Cat Is Curious And Tries To Get A Better Look, But A Few Seconds Later… OMG, Just Watch! 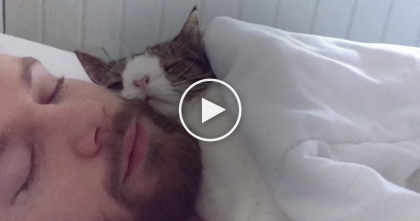 Man Rescued Strange-Faced Cat, But Now When He Goes To Bed…This Is SOO Sweet, Just Watch!